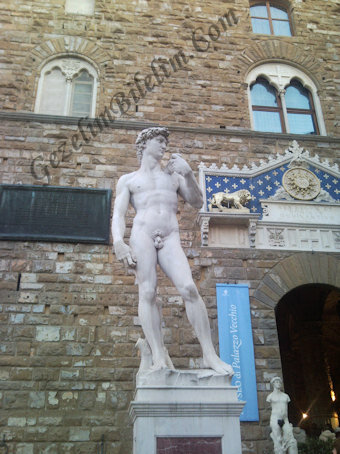 I can tell you Florence was the most impressing city in my Italy trip, it is one of cities which attects art history students interest too much. City fully reflects The Renaissance History. Buses can not enter to historical places, as in every Italian city. After i get off the bus i start to walk near by Arno river watching amazing. When i look at Arno river first thing which attract my interest was small rounds inside of the river. Those are kind of rounds were built to avoid small waterfalls to turn into big waves.the tower which you see right oposite of river is built to prevent city from threats as you may guess, you may see those kind pf towers at critical defence by force of arms places. When we walk though we see the library which is built in 1747 and saves 5.500.000 books. Small images you may find at all roof are part of Florance which attracted my interest too much. Those are kind of images are done very detailly and elegance. You look at one of them in below photograph which’s on top of library. 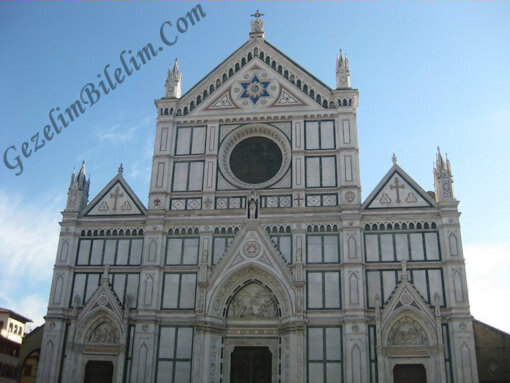 “Santa Croce Basilica” is the most popular basilica in Florarance,also we may call this basilica as one of the marvelous builts in Florance. Plus it is the most important church of Franciskan denomination. However you can’t find this magnificence inside of built, which is not sophisticated. Town was under covertre of Medici Family for a very long time. 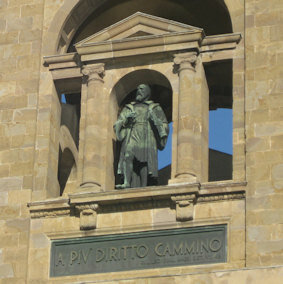 As you may guess Medici name comed from “Medicine”, since family was mainly interested in medicla science. 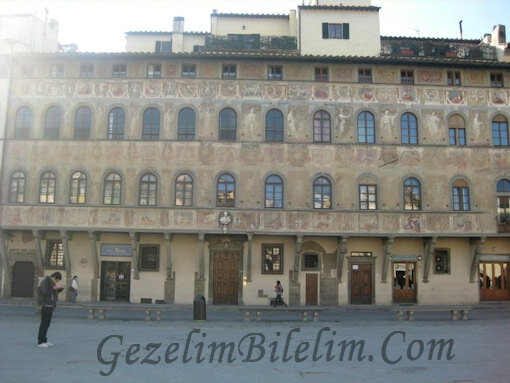 You may meet emblems belongs to Medicini Family in every part of Florance, as Ottoman emblem which you find over Turkey Palaces. 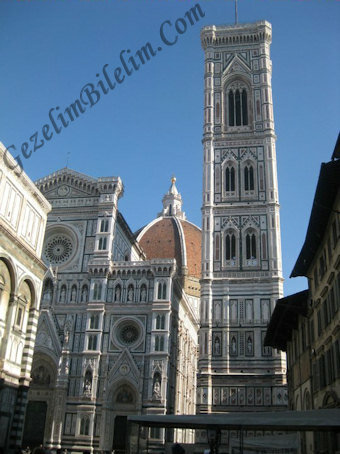 I eagerly suggest you to visit Croce Basillica’s Bell Tower in Florance. Entrance was not too expensive but authories do not suggest older people to reach Bell Tower, since it is very hard to clamp stairs. 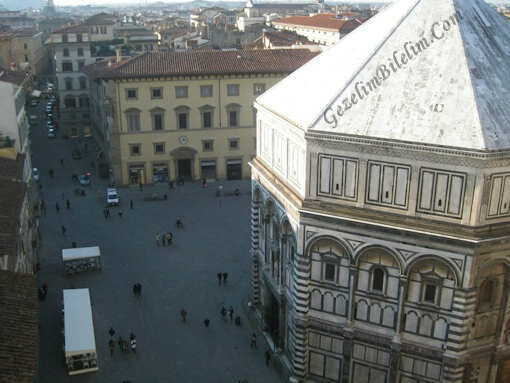 I leave you alone with Florance’s impressive scenery from top and its baptistery. Medici Family think theirself superior than community, because of that they hadn’t been liked to walk middle of community and cross rivee. 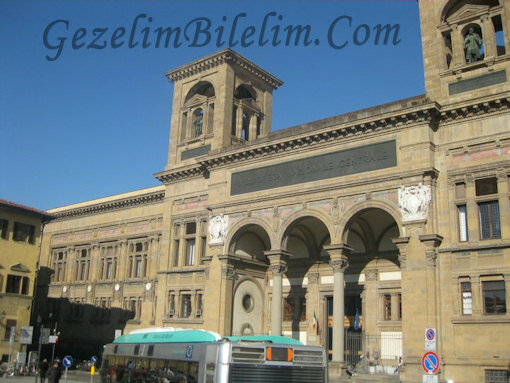 The had built a king road which is lenght can reach to kilometers at upstairs of their station whihc is called as Uffizi( means office in English). This road crosses Ponte Vecchio Bridge as well, by this way they had been crossed river and went whereever they want without wailking middle of community. To built this road they had been bought all required houses, but one person hadn’t been wanted to sell his house. That’s way this special road had been had to circle this man’s house. 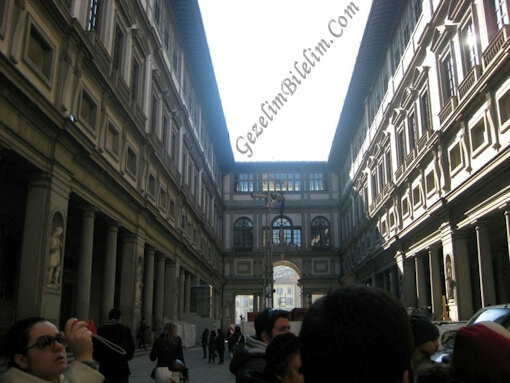 Here is the view of Uffizi. As you may see from picture in every where ther are images of saints and artists (includinf Leonardo da Vinci) in every block. You may see interesting buildings in every road. You may see one of interesting building in below picture. If you look carefully to building, you will find out reason why i call it as interesting. Left and right windows are not on same line. Reason of this is the priority of religion, they had been wanted everybody to see Basicila from every floor/part of this building. We know artists went after capture of Istanbul. Most of community thought church as a threat and they supported art and renaissance for modernization. 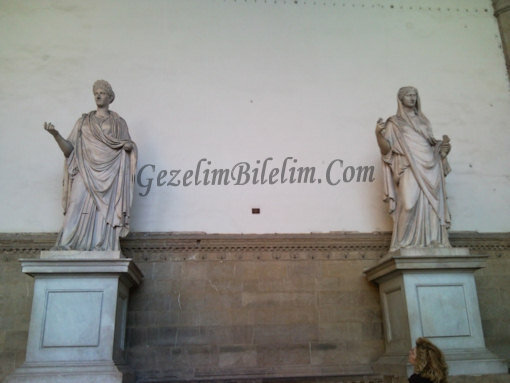 Sculptures are mark of Vatikan and Florance is one of metropole where renaissance idea come out, that’s way you can not see scupltures in Florance. As Florance people think Vatican so The Pope is thread, this is the way they show reaction. 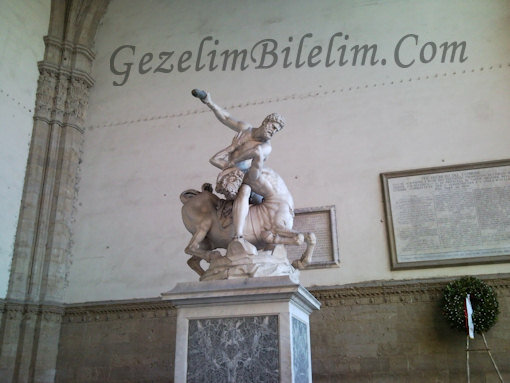 I land you with sculptures in Signora Square is the most popular square in Florance (you may see famous Davud sculpture right below of photograph, sculpture is fake, original one is being kept i Florance Academy Galery for protection). To find big size photographs you may visit galery below web page. If your budget is enough, you may stay at boutique hotels which are in center of Florance. Altertantively you may stay at hotels which are located in Montecatini zone with cheaper prices. 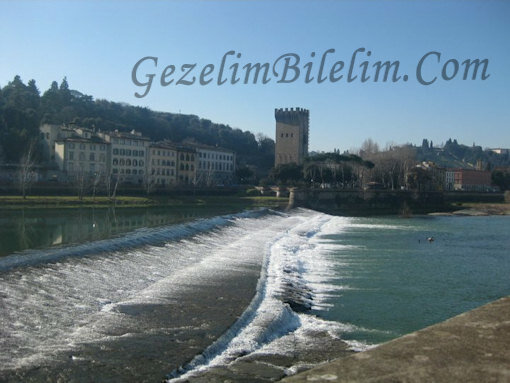 Montecatini is a place located between Florance Pisa , it is famous with its SPAs and health-giving waters. Montecatini is a townshipe which is very rich. Everybody is rich here, in every road you may see quality cars such as Lamborghini, Ferrari. Richness of this township comes from its SPAS and helath-giving waters. What to buy from Florence? Toscana is kind of place which is famous with leathers. You can not in any place of Italy with those price as Toscana. Middle of Florance there is a leather bazaar which is open for every day of week. You may buy very qualified bags, coats with very cheap prices. 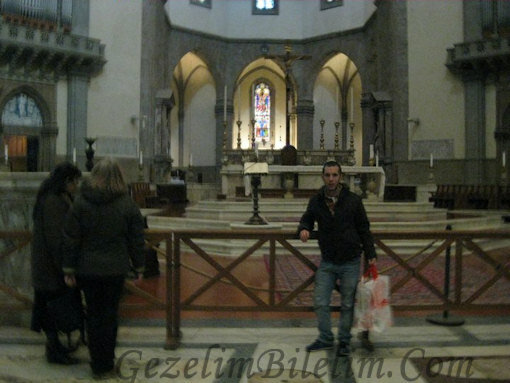 Besides of this your may find stores of every famous landmark, but i may tell Milano has more options for famou stores. I suggest you to make your luxuary shopping in Milano. I absolutely suggest “Seague” which is Florance’s own landmark. You may buy very cheap and qualified bags and luggages. By the way silversmiths and jewelleries which are over Ponte Vecchio Bridge are very famous. From those storages you may shop for yourself or for gift, but i can not tell as prices are cheap. What to eat – drink in Florence? Cappucino and Tiramisu are indespansable duo of Italy. Famous Italian Pizza with thin pie and Lasagna are tastes which are indespansable as well. I suggest you to visit Napoli to but famous Italian pastes. There are comprehansive ranges of clasical, hand-made pastes in Napoli.